For the safety of all passengers and our crew, please put your carry-on baggage in the rack above your seat or under the seat in front of you. Passengers seated near emergency exits (including those seated near wing exits and in the first row) must put their baggage in the overhead rack to ensure that the baggage will not hinder evacuation in case of emergency. We will inspect your carry-on baggage before check-in and boarding. Please do check your carry-on items that exceed the limits to weight, number of pieces or volume. If the baggage you carry exceeds the free baggage allowance, you will be required to pay excess baggage fee and place the baggage in aircraft’s cargo compartment. According to the Regulation on the Transport of Dangerous Goods by Air (Order No. 42 of the Ministry of Transport of the People's Republic of China, 2016), if your carry-on excess baggage doesn’t comply with relevant regulations, you must re-check the baggage at check-in counter or self-service baggage checking equipment, and such baggage may not arrive at the destination on the same flight with you. CSAir has the right to determine at our discretion whether your baggage should be treated as carry-on baggage or checked baggage to ensure your safety and comfort as well as the safety and comfort of other passengers. Note：Carry-on items that exceed the above limits to weight, number of pieces or volume should be transported as checked baggage. Please check your baggage at the check-in counter or self-service baggage checking equipment in advance. China Southern Airlines may inspect your baggage at check-in counter, security check counter, boarding gate and cabin. Your baggage exceeding the free baggage allowance will be charged as per excess baggage rate. Note：Fees charged at the boarding gate exclude free baggage allowance (FBA) and prepaid baggage which can only be used at the check-in counter. 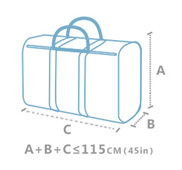 Helpful Tips：I.Carry-on luggage with the sum of three sides less than or equal to 115 CM (approximately the size of a 20 inch luggage case. Please refer to airport security check for details. II.Any item in excess of carry-on baggage weight, number or size as listed above will be required to be handled as checked baggage. 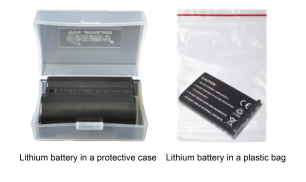 Purchase only standardized lithium batteries or power banks! Spare lithium batteries and power banks can only be placed in carry-on baggage. Power banks should be powered off for the entire duration of a flight. Power banks cannot be used to charge devices while on the plane. You may not charge a power bank on the plane or use any of its other functions. III.You do not need to declare lithium battery-powered devices or spare lithium batteries that do not exceed 100 Wh (watt-hours). A reasonable amount of spare lithium batteries can be placed only in carry-on baggage for boarding. IV.Lithium battery devices or spare lithium batteries that exceed 100 Wh but are no higher than 160 Wh shall be declared to China Southern Airlines for approval. 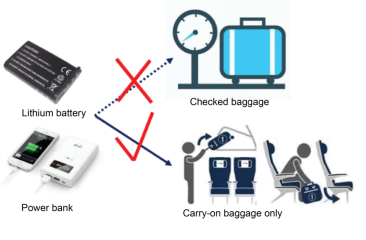 Under this guideline, you are limited to 2 spare lithium batteries in your carry-on. V.It is forbidden to carry on lithium battery-powered devices or spare lithium batteries that exceed 160 Wh (powered wheelchairs that use lithium batteries are allowed). To prevent explosions or combustion due to scratches, impacts, or short-circuiting, place lithium batteries individually in their original retail packaging, plastic bags, or in protective cases, or cover any exposed electrodes with tape. 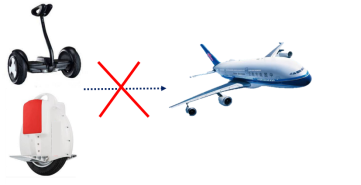 VII.Electric self-balancing vehicles cannot be carried on the plane. 1. All liquids, gels, and aerosols must be stored in containers with a maximum capacity of 100 ml. Any items over 100 ml (even if not full) are not allowed in the cabin and must be placed in checked baggage. 2. All liquid containers should fit comfortably inside a re-sealable transparent plastic bag with a maximum capacity of 1 liter (L). Each passenger can only have one transparent plastic bag and shall transport any liquids which exceed this limit in their checked baggage. 3. The plastic bag used to hold liquids must be checked separately at the security checkpoint. Baby formula, milk, or breast milk (only for passengers travelling with infants) and other required liquid medicines brought by diabetics or other patients should be submitted for inspection with appropriate labelling at the security checkpoint. Liquid medicines should also be stored in 100 ml containers in a transparent plastic bag. 4. Any liquids purchased beyond the security checkpoint within the airport terminal can be carried on board.